As part of a blog tour organized by Great Escapes Virtual Book Tours, I’m here to tell you about Death of a Brooklyn Landlord, the latest release by Susan Russo Anderson. When newly widowed Lorraine McDuffy gets a call in the middle of the night, it’s not the ghost of her dead husband on the line, but the trembling voice of an old flame, Frank Rizzo, a local butcher. He’s found the battered body of rent-gouging Brooklyn landlord Viktor Charnov. Felled by blunt trauma to the back of his head, the victim lies in the fetal position in the back of Frank’s shop, a pork chop clenched between his teeth. The distraught butcher asks Lorraine to investigate. As the story moves through the entangled web left behind by the landlord’s evil dealings, Lorraine searches for Viktor’s estranged wife as well as a missing teen with ties to the landlord, believed to have jumped in despair from the Brooklyn Bridge two months earlier. Along the way, Lorraine spars with Detective First Grade Jane Templeton and cares for the victim’s ten-year-old son, baseball-loving Joey Charnov, while she searches for his mother. And despite her guilt, Lorraine and Frank deepen their relationship in fits and starts. If you’re a fan of Fina Fitzgibbons and her crew, you’ll recognize the main characters in this new series—Lorraine McDuffy, Fina’s mother-in-law and protagonist in charge of the Fina Fitzgibbons Detective Agency while Fina and Denny are on their honeymoon; detectives Jane Templeton and Willoughby, her partner Minnie, admin assistant at Lucy’s and now taking on a greater role in the agency; Cookie and her husband, Clancy; and a newcomer, Fina’s estranged father, Paddy Fitzgibbons, who creates his own boozy havoc as he tangles with Lorraine and Cookie. Death of a Brooklyn Landlord is available on Amazon . A Mystery, A Kidnapping, A Missing Mom … The First Book in a NEW Spinoff Series! 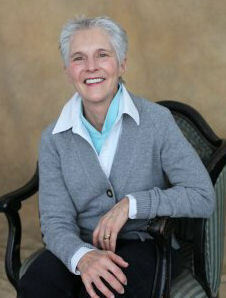 Susan Russo Anderson is a writer, a mother, a member of Sisters in Crime, a graduate of Marquette University. She’s taught language arts and creative writing, worked for a publisher, an airline, an opera company. Like Faulkner’s Dilsey, she’s seen the best and the worst, the first and the last. Through it all, and to understand it somewhat, she writes. Too Quiet in Brooklyn, the first book in the Fina Fitzgibbons Brooklyn mystery series, published December 2013. The second book in the series, Missing Brandy, about a missing teen, published September 2014, and Whiskey’s Gone, about the abduction of a single mom, completes a trilogy. The working title of the fourth is Dead in Brooklyn. This book looks like one I would enjoy. It’s a similar genre to my own books. Thank you for being part of this tour!